With the world embarked on a journey to continuous advancements, researchers and scientists around the globe are equally braced up to cater the needs of latest technological expeditions. Through continuous effort, development and research, it has become the manifesto of almost every physicist to bring latest technology in the most portable and conveniently used form to the general population. Development of amazing single molecule LED’s are a part of the same facilitative project. A LED is basically a semiconductor designed in such a way that it has two leads. The distinguishing feature that makes LED stand out from other technically designed semi-conductors is the fact that it emits light. 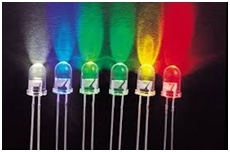 This explains why LEDs are called as light- emitting diodes. It is also worth mentioning that diodes are specialized electronic components devised in which one lead is anode while the other is known as cathode. Anode serves as the positive terminal whereas cathode is the negative terminal to the diode.